Chairman of the Caribbean Council of Legal Education, Reginald Armour; Guyana’s Attorney General Basil Williams and Guyana’s Chancellor of the Judiciary, Yonnette Cummings-Edwards. Guyana is not yet ready to establish the proposed Joseph Haynes Law School because the Caribbean Council of Legal Education (CLE) has found a number of gaps in the feasibility study, Council Chairman Senior Counsel Reginald Armour said. He told reporters that the CLE could not give its full stamp of approval because a number of questions have surfaced from the feasibility study that was submitted by Attorney General, Basil Williams on 4th July, 2018. Armour said the CLE would examine a report on the feasibility study by its sub-committee because that study was not in keeping with the rules of the Council. “The feasibility study is not treaty-compliant. In other words, it does not fit within the Treaty that the Council of Legal Education operates under,” Armour said shortly after the opening of the Council’s meeting in Guyana. Reflecting on a meeting that was held by the CLE sub-committee and the joint venture partners on 3rd September, 2018 in Guyana , he said there were “concerns” about the study in the area of quality. “The feasibility study does not satisfy the quality assurance that we would require,” he said. The CLE Chairman also said there was no curriculum. “We need to see a curriculum. There was no curriculum,” he said. In that regard, Guyana’s Attorney General Basil Williams said “we had agreed” that the Trinidad-based Hugh Wooding Law School’s curriculum would be used and he attributed the Council’s observation to “probably a line that was left out; it was not a big deal”. Armour added that the Council was expected to set a timetable to continue talks with the Guyana government about establishing a law school in Georgetown. He disclosed that “we have asked for a better feasibility study”. But Williams said that “we’d give more details on that”. “They (Council) have raised some queries and we are going to respond to them. We have to have another meeting,” he added. The Attorney General further informed that the Jamaican partners- joint venture partners- University College of the Caribbean (UCC) and the Law College of the Americas (LCA)- have already submitted their responses to questions on the feasibility study. Government intends to build the Joseph Haynes Law School on land provided by the University of Guyana. 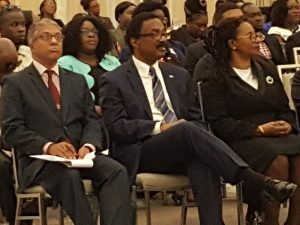 The Guyana Attorney General reiterated at the opening session of the Council meeting that Guyanese were finding it expensive to pursue legal certification in Trinidad and the 25-person quota for University of Guyana graduates was unacceptable. A Canadian-funded study had recommended the Council evolve into a regulatory and licensing agency insyead of merely operating law schools. The Caribbean’s law schools are Hugh Wooding, Norman Manley in Jamaica and Eugene Dupuch in The Bahamas.